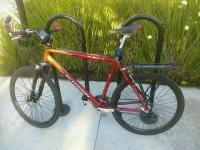 There this bike a gmc denali that has them i think is pretty nifty. I would like to in stall something like that on some bars i have. But dont know if some eles has done it. Well, if you do that you cannot really shift as conveniently as with any other setup. Twist grips on drop bars are one of the worst ideas I have seen cropping up in the last year or three. If you ride only on the flats of the drop bar, why not get a flat bar? If you ride on the drops it is easier to just let one arm drop to the downtube shifters to shift. There is absolutely no need to take the eyes off the road (even with friction shifters). STIs (Shimano) or Ergos (Campa) or the SRAM version (forgot the brand specific name), called "brifters" by some, are even (quite a bit) better, but also more expensive, though you can get 9 speeds for about 100 EUR if you shop around. I think that the only setup that is as bad as the one proposed is stem mounted shifters. (I also think it looks really... bad). Quote: The Denali gets a 5-Star rating from me, and so does WalMart for the excellent assembly and pre-sale adjustments they did on the Denali bike. Yeah, right. Not the experience one reads about in this forum and elsewhere... he got lucky with probably one of the few department stores where the assembly people know what they are doing. The Denali has three piece split bars to allow the installation of the grip shifters. The split bars are much heavier than, not as stiff, nor as strong as regular bars. You can find 7 and 8 speed STI for less than $100- on ebay, and a bit over $100- on Amazon - new; 9 speed for under $150-. Microshift/Nashbar 9 speed is $120-; 10speed $150-. Campy, SRAM and high end Shimano are much more. The STI or Microshift route might be less expensive than sourcing a multi-piece drop bar. It is very cheap for the manufacturer, but rather difficult for one offs. Sorry... But i have to say im very excited today i passed my first federal exam to become an aircraft mechanic ! you could put trigger shifters on it.....there some examples on YouTube. I guess you could get (friction = no worries about # of gears) bar end shifters for quite a bit less than STIs. I have no experience with them, but there's many people who prefer them over downtube - I dislike the thought of fiddling around at the end of the drop bars at high speed though. In terms of ease of use nothing beats the integrated stuff. 3x8 is difficult to source around here, my usual suspects only have 3x9 and higher online. Nigel found some though, so you should be lucky. On the other hand, an 9 speed cassette will fit your hub and the dérailleur should work as well, so this might be an excellent opportunity to upgrade - maybe even to 10 speed (though I am not 100% sure how well the chain rings will work, 9 speed should)? The biggest investment are the shifters anyway. I guess 9 speed is probably the sweet spot, chains and cassettes are not as expensive and setup is not as fiddly and the whole system is more forgiving with dirt & stuff. To be honest, I did all of the upgrading and exchanging parts, but I probably should have left everything as it was (downtube shifters). Was it worth it? Yeah, maybe... but now I am overcommitted on the thing. Plus I just was told the fork is toast and the frame (likely) as well. Ah, well, parts for the project bike. Oh, and congrats on your exam! Bummer about putting all those shifting upgrades and finding out your bike is toast , Joe. 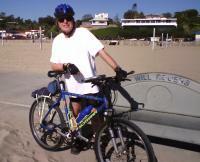 On my road bike I kept the nice downtube suntour friction shifters, They are solid and reliable. Take some practice getting the feel for them. My bike is 12 speed 2X6 I mostly use 3 gears in my rides. Do you guys really use 18 or more gears consistently ? I do. I like to have the cadence at about 100-110 rpm and really dislike the large jumps that 9 speed MTB cassettes have when compared to 10sp road ones - not a fair comparison, the road cassette is 11-25 and the MTB is 12-32. As soon as I had STIs I started using more gears. With downtube shifters I was more lazy. It is (for me) more a "smaller jumps" issue than a "range" issue: When riding in moderately hilly terrain on the road I mostly use the 39t chain ring in the front. It is important for me though to have a granny gear (30t) for steep ascends (up Lefthand Canyon in Boulder are some parts where I would have liked a smaller gear), the large chain ring is mostly when riding in a group downhill, exceeding 50km/h. I have no problem spinning 39-11 up to that speed. On practising with downtube friction shifters I once read the tip that one should actively try to shift between two gears, as this is much more difficult than hitting either one on the side. It gave me the confidence that basically no matter where I shift to there is a gear somewhere around that I will hit. However, when using the bike off road I really prefer not to take the hands off the bars in some situations, so STIs are (for me) the way to go there. On the road? Meh... downtube works well enough (though my "new" road bike has STIs).